Rodeo toys. Rodeo play set. Large collection of rodeo toys, arenas, cowboys, cowgirl and horses. There are rodeo event toys that include bull riders , bronc riders, team ropers, barrel racers, mutton busters and rodeo clowns. Rodeo bucking chute toy. The face of Western Toys has a new look. The PBR, NFR and cable tv have opened the gates of rodeo to a much wider audience and I believe that has helped create a larger demand for Rodeo Toys. While still very popular, plastic Cowboys and Indians and toy six shooters are not the only toys available. This Cowgirl says, that's a good thing. It's time for more realistic rodeo toys. So lets have a look at some rodeo playsets. There are playsets and individual toys for most rodeo events. 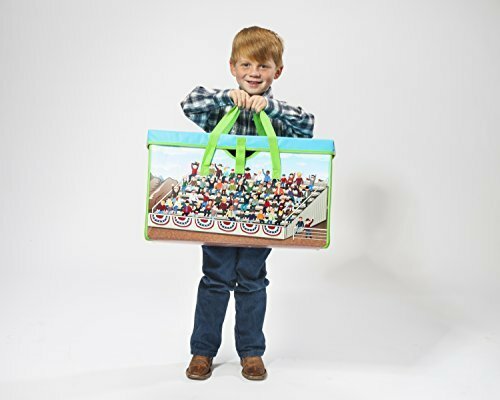 Big Country Toys has a 3 in 1 toy box with 2 play mats. When folded up, the box will hold large trucks, trailers and and other rodeo and ranch toys. When it is unzipped, one side has a printed rodeo back ground on one side and a ranch back ground on the other side. The play mats are 43" long and 36" wide. Bull Riding is one of the most exciting and popular events in rodeo. Cowboys gather around the bucking chutes to help each other mount their bull, tighten their rigging and get ready for what will hopefully be an eight second ride. Set up this arena with fence and chutes for fun round of bull riding. This set includes 3 bull riders and bulls and 3 other arena participants. ​The listing is not specific, but it looks to me like a rodeo clown and 2 other cowboys that could be the judges. This is a 12 piece set that includes a Bushwacker PBR bull and Flint the clown action figures. The fence and bucking chute are also included. There are several different bull and rider sets that include popular names from the PBR. The PBR branded bucking chute is available on the Bull Riding Toys page. 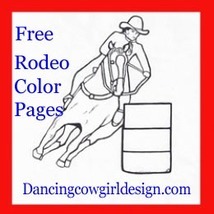 The Wrangler NFR chute is on this page shown under Bronc Riding Toys. Visit my page that is just for Bull Riding and PBR toys. ​It is full of the best bull riding toys including bouncing bull toys to ride on, play chaps and vest, bull costume, soft bull toys and more. The kid size Rodeo Bucking Chute is shown here with a bronc rider. I have the bouncy horse shown separate farther down the page under Barrel Racing Toys. 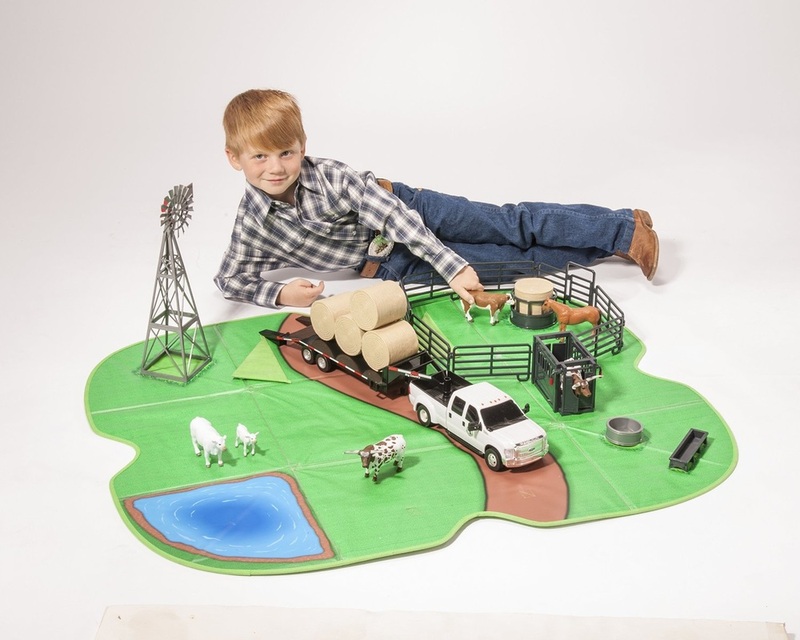 There are a few playsets that come with a truck and trailer so you can load up and head on out to the next rodeo. These below include the most pieces available in this type of set. There are some other truck and trailer combinations that come with a a couple of animals and some truck and trailer combinations alone. This set is a combination of diecast and plastic. It has the truck and trailer set and plastic cowboys and animals. This is a similar set to the one above except this one is geared toward ropers. Cowgirls get a turn in the arena also with this pink truck and trailer set. It comes with the horses and riders, fence and barrel racing accessories. It is sure nice to come home with a some winnings in your pocket, but it takes some money for entry fees to get started. I found some rodeo money that will be perfect to go along with any of the rodeo toys or for a little back yard rodeo fun. Mom or dad join in on the fun by acting as the rodeo secretary to sign up the contestants and pay out the money to the winners. This cowboy is ready to go roping or do some ranch work. ​Big Country Toys Roper Cowboy with horse, saddle rope and tack. Kids will be able to set up a steer chute and roping boxes and have a big time team roping. There are 2 horses, 2 cowboys and a steer included with this set. This same setup can be used for calf roping also, but you will need to get a calf to go with it. Little Busters Calf Chute has welded construction. 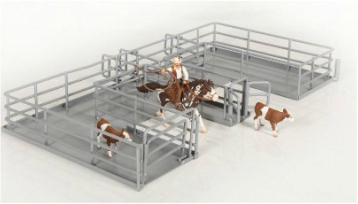 This set comes with full swinging gates and calf chute. This smaller roping toy is called team roping by the maker, but the picture shows a calf instead of a steer. 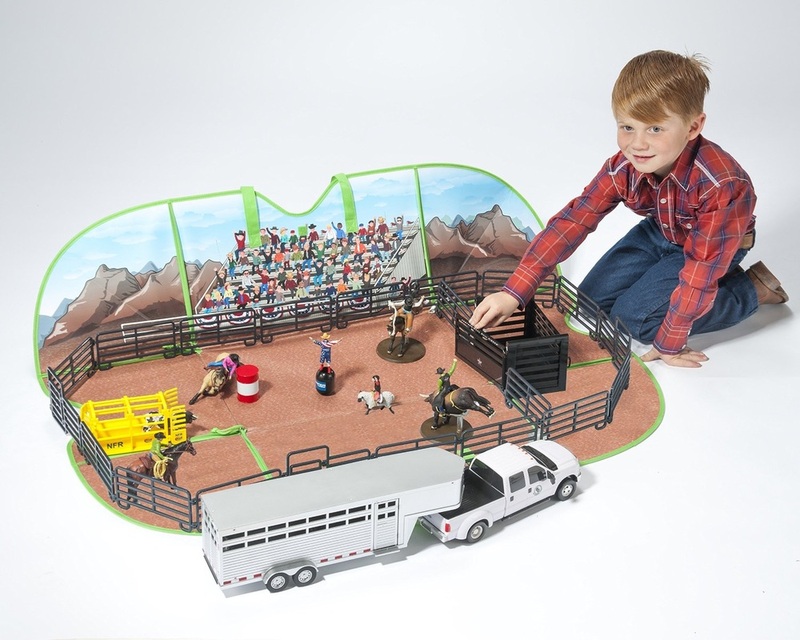 ​​This barrel racing play set comes with 3 barrels, 2 horses, 2 riders and arena fence. 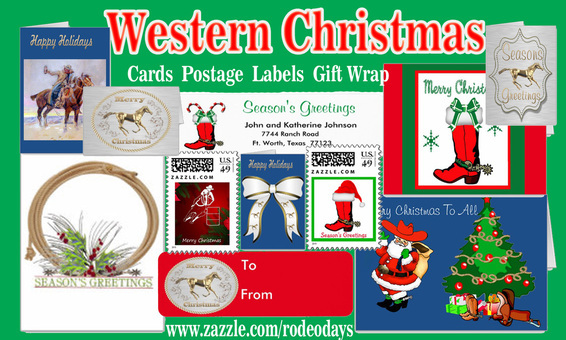 This set includes the cowgirl and horse with bridle and saddle. There are also 3 barrels and 4 pieces of fence. 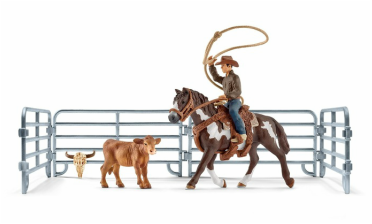 Another well rated horse toy from Breyer is this barrel racing set that includes an appaloosa horse. It also comes with the saddle, saddle pad, bridle, 3 barrels and 6 sections of fence. 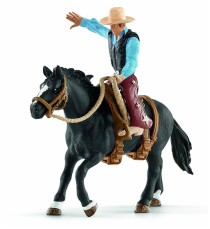 This is called a figurine, but it is a barrel racing toy from Big Country Toys. It is 1:20 scale and hand painted. It fits with other Big Country Toys. Barrels and bouncy horse sold separate. This set comes with 3 pop up barrels with Wrangler NFR and PRCA logo. They are 22 inches tall and 18 inches in diameter. Another set of pop up barrels in pink. They do not come with the stick horse. See stick horses and other ride on horse toys here. 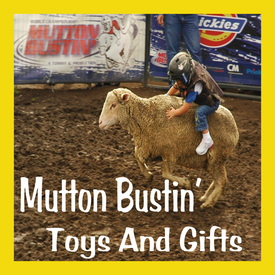 This little mutton buster is by Big Country Toys. It is hand painted and comes with the mutton buster, mutton and the bull rope. This will be a fun addition to any rodeo set. The cutting horse set comes with the horse and rider calf and 4 pieces of fence. Here are some individual pieces that are good alone or for putting together your own rodeo play set with the exact pieces you want. Papo is a nice size bull toy at 5.91 x 2.8 x 3.46 inches. Ford F350 Dually with crew cab. The back tailgate opens and has the attachment for the Big Country Sundowner Stock trailer (sold separately). This truck measures 12 1/4" x 5 1/2" x 4". A replica of Sundowner's 28' Rancher - Will hold Big Country cattle and horses. Opens in back and on the side. Connects to the Big Country Ford dually truck (sold separately). Trailer measures 16 3/4" x 5" x 5 1/4". This is a hand painted cowgirl and horse toy. The rider, saddle and bridle can be taken of to give that horse a rest. How about this for action. The Paradise Pozables have a bendable horse and rider that is fully poseable. The saddle and other tack for the horse are included along with a brush and a carrot. Paradise Poseables has a good selection of horses that come in several colors and in pony sizes. They come with a bridle, comb and a carrot. The cool thing I read in the description of these horses is that you can register them and get a certificate of authenticity. Besides that, they are fully posable and their mouth opens up to accept their carrot or put a bit in their mouth. Get a dozen hard plastic pvc horses. Great for play, party favors and stocking stuffers. Enjoy a fun rodeo version of this family favorite. Use parts and pieces from your rodeo toys for a cake topper like the on this cake. Little Cowgirls will love this wooden magnetic play set. It comes with Becca and her horse Beauty with stands. It also comes with a shadowbox stable and all of the different western tack for the horse and lots of colorful cowgirl outfits for every event. The second picture is a better view of the clothing and tack pieces. It is recommended for ages 3 and up. There is also an English riding version of this set. 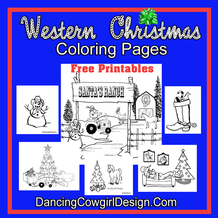 Be sure to get these free printable coloring pages.